Cloud Accounting - Why it's time to take the plunge! 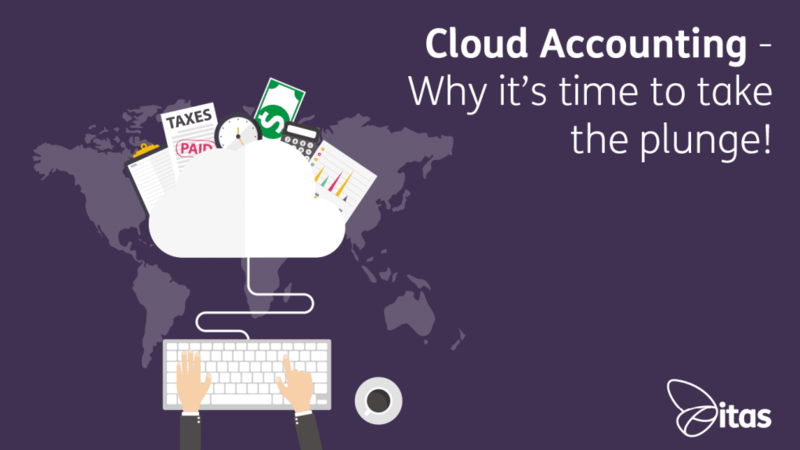 Cloud Accounting – Why it’s time to take the plunge! Over the past few years, the cloud has become a very popular thing. Giving people around the world the ability to store, access and share data anytime they want; with ease. It is fast, efficient and secure, so why isn’t every business utilising it? Before we get into the advantages of the cloud, lets make sure we are clear on what cloud actually means in terms of accounting software. “Cloud computing accounting software is accounting software that is hosted on remote servers. Data is sent into ‘the cloud,’ where it is processed and returned to the user.” (Source: Webopedia). The cloud is a wonderful place, that can be accessed anytime, from anywhere and using any device. This allows businesses a freedom and flexibility that is otherwise difficult to achieve. Simply logging in from a browser means you can access your accounts on your desktop, tablet or mobile phone. Being limited to a central hard drive and machine is now a thing of the past. Armed with a device and internet connection, you and your business have the power to access all of your data. With lower monthly costs, unlimited accessibility and real time data, cloud accounting clearly seems to be the way forward. But, is it as good as it sounds? Not as accessible – as already discussed, cloud is accessible from pretty much anywhere. On-premise often need installation on the machine to be used on. Larger upfront cost – often on-premise solutions are much more costly generally. But add in the IT costs, server costs, running costs, implementation costs and suddenly you are looking at a hefty bill. Updates and maintenance essential – updates are not automatically applied to on-premise solutions, and often involve another cost! Cloud based solutions are much easier to upgrade, most of the time you wont even know you’ve been upgraded! Additional hardware and IT can be required – as we eluded too above, servers, desktops and other hardware are usually things that are key in the implementation of software. Before cloud accounting, problems like these have been tolerated for lack of alternatives. Now, with the rise of the cloud, everything is changing. Effortless updates – there is no install of updates, and often no charge. At least once a quarter you can expect updates to be pushed to your system. Similar to iOS updating on your iPhone! In the terrible event of your hard drive/laptop/server being damaged, you may struggle to restore your data. By storing your data on the cloud, nothing is lost as all of your data is stored online safely. Sage have been at the forefront of the cloud accounting world, rolling out Sage Financials as their flagship product. Sage Business Cloud Financials is an accounting solution built on the Salesforce Platform. Salesforce is the worlds number one cloud based CRM platform. The drivers of Sage Financials are to enable your team to work as efficiently as possible by automating your processes. This means Sage Financials has been designed to work seamlessly, effortlessly and in the most flexible way possible. Whatever your reasons for choosing cloud, its time to take the plunge! If you are interested in finding out about Sage Financials or how your business could benefit from a move to the cloud get in touch with the a member of the team! Home » Sage Blog » All Sage Blog Posts » Cloud Accounting – Why it’s time to take the plunge! Want to talk to a product specialist?